Strikers with UNITE HERE Local 26 held a picket line outside of the Ritz Carlton in Boston on Friday. It was a very Boston labor demonstration, with striking hotel workers not only railing against corporate management, but also a certain baseball team from New York. “Yankees=scabs” read the pinstripe-adorned signs held aloft as scores of workers pushing for better benefits and workplace protections marched through downtown Boston late Friday afternoon. The reason for the public rebuke of the Bronx Bombers? 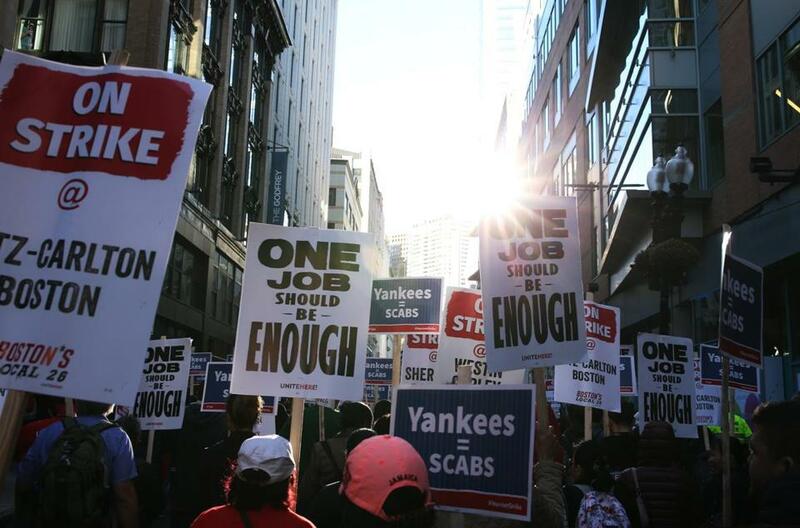 The Yankees players, who belong to the players’ union, failed to respect a picket line at the Ritz-Carlton Boston, which is a Marriott hotel, according to UNITE HERE Local 26, the union that organized the march. Most of the Yankees, who are in Boston for the start of the divisional playoff series with the Red Sox, their longtime rivals, arrived at the Avery Street hotel Thursday on a team bus. A smattering of players arrived in their own vehicles, said Brian Lang, Local 26 president. The Ritz-Carlton is one of seven Boston hotels owned or managed by Marriott. Workers walked off the job at those seven establishments Wednesday morning, launching the city’s first major hotel strike in modern history following months of fruitless negotiations. In Boston, UNITE HERE represents an estimated 1,500 Marriott International employees, according to the union. The union is pushing for more protections for workers as the industry undergoes major changes, mainly driven by technology, and is calling on companies to protect worker hours, provide more secure schedules, and improve sexual harassment protections. “It’s true, the Yankees are scabs,” Lang told the marchers through a bullhorn outside the Park Street MBTA station. The strikers did not see Yankees players before Friday’s playoff game, said Lang before the march. “Like the cowards they are, they went out the back door,” he said. Messages left with the Yankees were not immediately returned Friday. At the Ritz, the union demonstration continued Friday evening, with picketers chanting and marching in front of the hotel’s main entrance. Marvin Martin, a 46-year-old Peabody resident who works as a bartender at the Ritz, said he was disappointed the Yankees players crossed the picket line. “They shouldn’t be staying at a Marriott hotel, period,” he said. Carmen Agimi, a South End resident who works in housekeeping at the Ritz, hoped the dispute is resolved soon. She was also upset by the Yankees’ decision to stay in the hotel. “Even if they have a contract here, they’re supposed to respect the employees because we have served them for years,” she said. Jean Michel, a 45-year-old Randolph resident who works as a banquet server at the Ritz, was frustrated by what he considered to be Marriott’s intransigence. Jose Sanchez, a 42-year-old Randolph resident who works in room service at the Ritz, said he felt disrespected that Marriott allowed the labor dispute to come to a strike. “The company has made billions off our back and, you know, we deserve a decent living,” he said. Workers went on strike Wednesday after six months of contract talks ended without an agreement. UNITE HERE locals in San Francisco and San Jose are also currently striking at Marriott hotels in those cities. Lang, the Local 26 president, said the union and Marriott are keeping “the lines of communication open.” He expected a bargaining session to occur sometime next week. The Globe has reported that the union represents employees at more than 30 hotels in the Boston area but is focusing on Marriott, the largest hotel company in the city and the world. Striking hotel workers marched toward the Boston Common on Friday.